The Sunday of Advent - the last Sunday of Lent. How to prepare for the Second Coming of Christ in Armenian Orthodox tradition. Sermon delivered by Fr. 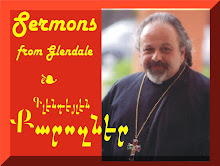 Vazken Movsesian and recorded LIVE at the St. Peter Armenian Church & Youth Ministries Center in Glendale, 09 March 2008. In Armenian. Sermon - Sunday of the Judge - Preached and recorded LIVE at the St. Peter Armenian Church & Youth Ministries' Center Theme: Prayer. How important is prayer in the life of a Christian? What about in terms of world peace? Implications for the indivual, the community and world. In Armenian - synopsis in English at the end of the sermon.